This site features online versions of all the Harper's Weekly newspapers printed during the Civil War. These papers are an excellent resource for the serious student of the Civil War. The illustrations were made by war correspondents deployed with the troops on the front lines. 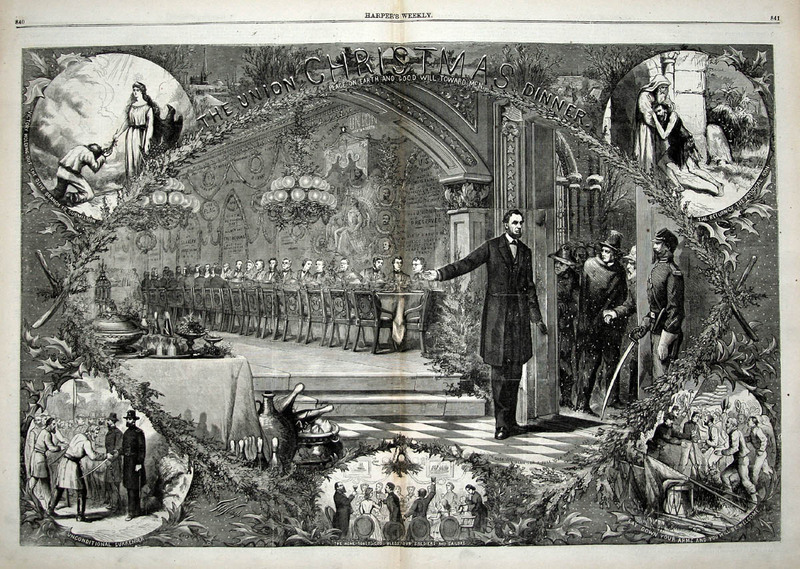 You are viewing a stunning image by Thomas Nast entitled, "The Union Christmas Dinner, Peace on Earth, and Good Will Toward Men". The image reflects the Nation's desires and hopes that the Civil War would end soon. The Nation had been bloodied through 4 long and terrible years of Civil War, but by Christmas, 1864 the end was in sight. In this illustration Nast shows Abraham Lincoln, representing the North, holding out a hand of friendship to the South. The image shows Lincoln opening the door to a large banquet hall, and inviting hungry rebels in from the cold. This image is surrounded by images of scenes of surrender in the Civil War. The lower left inset shows Robert E. Lee Surrendering to Ulysses S. Grant. At the point Nast made this drawing, this was simply a hope, but it did occur within the next six months.